living and a desire to become positive community members. HHFL provides a safe and supportive place where the children and youth can experience new opportunities, overcome barriers, build positive relationships, and develop confidence. Through these programs, we are helping the children become better prepared for success in life. Volunteerism is integral to the skills training program. All HHFL youth are expected to lead the activities for their younger peers as a way of giving back and developing mentorship skills. The Saturday Morning Kids Club takes place every Saturday morning on the HHFL compound for the primary school children. Activities include a range of sports, arts and crafts, computer training, music and drama. The After-School Program takes place between 4-8pm Monday to Friday on the HHFL compound for the primary school children. 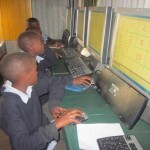 Homework supervision and extra tutoring is provided as well as mandatory computer training. The School Holiday Program takes place in August, April and December. The HHFL children return to the compound on holidays and participate in a wide range of structured activities that combine fun and learning.